Every Thursday, we will present a topic for you to think about and share your views either through your own blog post or through the comment section. This entry was posted on Monday, October 1st, 2012 at 7:09 pm and is filed under Thursday. 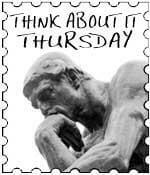 http://TheDailyMeme.com/think-about-it-thursday/ generated Tuesday, April 23rd 2019 at 6:43:54 am.